Rediff.com » Movies » Why you should head to Goa RIGHT NOW! Why you should head to Goa RIGHT NOW! As I stood in the lobby of Goa's Marriott Resort and Spa, I had a rare sighting. Two of the gods of Hindi cinema were talking to each other, and waiting for a car to take them for the opening of the International Film Festival of India. 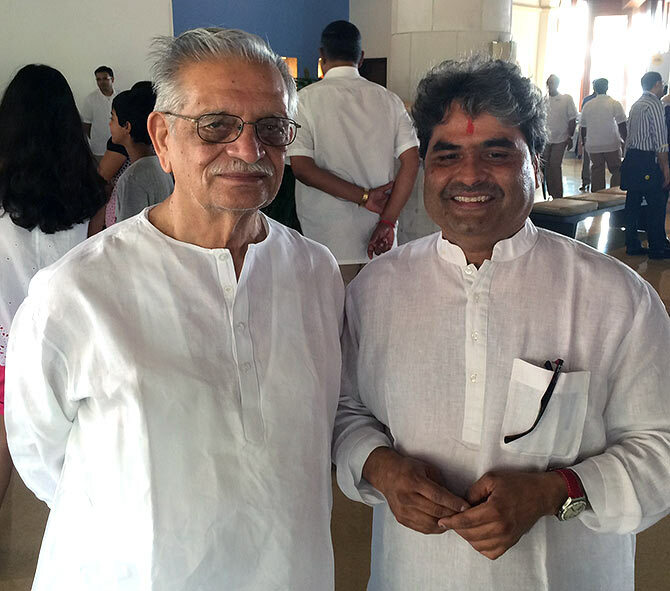 Gulzar, poet, lyricist and filmmaker, was with his protege and one of Mumbai's best directors, Vishal Bhardwaj. I have known Bhardwaj and his singer wife Rekha for many years. That afternoon, I could not resist saying hello to Bhardwaj, more so because I wanted to be introduced to Gulzar. The fan in me asked the duo if they would oblige me for a photograph. I caught them in their crisp white kurtas smiling, looking relaxed despite Goa's humid weather. 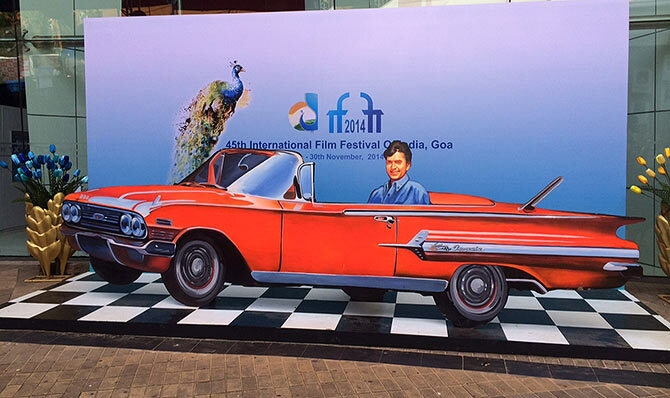 I arrived in Goa from Delhi to attend the Film Bazaar, organised by India's National Film Development Corporation. Across town in Panjim, guests were gathering for IFFI's opening night with two pillars of the Indian film industry, Amitabh Bachchan and Rajinikanth. But I decided to stay back at the Film Bazaar, where that evening and the next three nights, there would be cocktail receptions right by the beach. And every night, there were major celebrity sightings. The first night I saw Rajat Kapoor and Sudhir Mishra talking to a group of young fans. Later, I saw Anurag Kashyap, Umesh Kulkarni (who directed Rani Mukerji in Aiyyaa), Dibakar Banerjee (of Shanghai fame) and Vidhu Vinod Chopra with his journalist wife Anupama. One evening, I saw The Lunchbox producer Guneet Monga chatting with Subhash Ghai. Given the very different cinemas the two represent, I wondered what they must have been discussing. 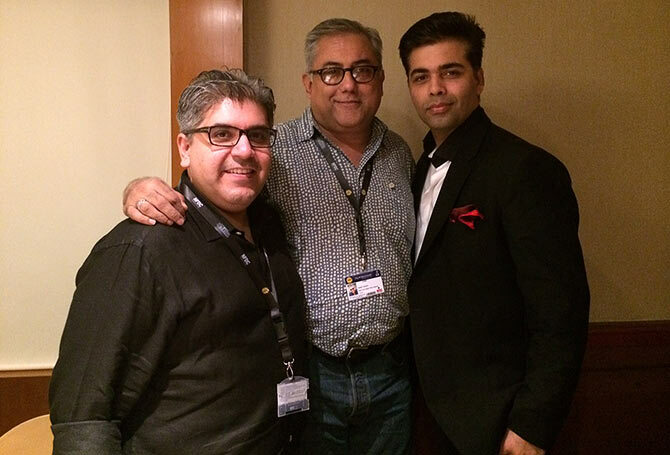 Image: Rajeev Masand, Aseem Chhabra and Karan Johar. The Film Bazaar was packed with script-writing workshops, production meetings, and industry screenings where filmmakers introduced new films for potential distributors and film festival programmers. One afternoon, I spotted Karan Johar and film critic Rajeev Masand having tea with Nina Gupta, the head of NFDC, and barged into their meeting. Johar has known my work for a while, but we had never met. We joked about that and commemorated the moment by getting a picture taken. At the other end of Panjim, IFFI was on in a big way with movie screenings at several venues, like the INOX multiplex and the Kala Mandir, which is dedicated to Lata Mangeshkar's father Dinanath Mangeshkar. I watched Shabnam Sukhdev's documentary, The Last Adieu, her attempt to discover her nearly absent filmmaker father Sukhdev through his documentaries. Sukhdev was one of the leading documentary filmmakers in post-Independence India. The film captures his life through the eyes of his friends like Shashi Kapoor and Shaukat Azmi. One of the best films I saw at IFFI was The Theory Of Everything, director James Marsh's exploration of astrophysicist Stephen Hawking's life. It is a gripping look at Hawking's life and his struggle with ALS, also known as Lou Gehrig's disease. Eddie Redmayne plays Hawking with such brilliance that he should be among the front-runners for next year's best actor Oscar race. 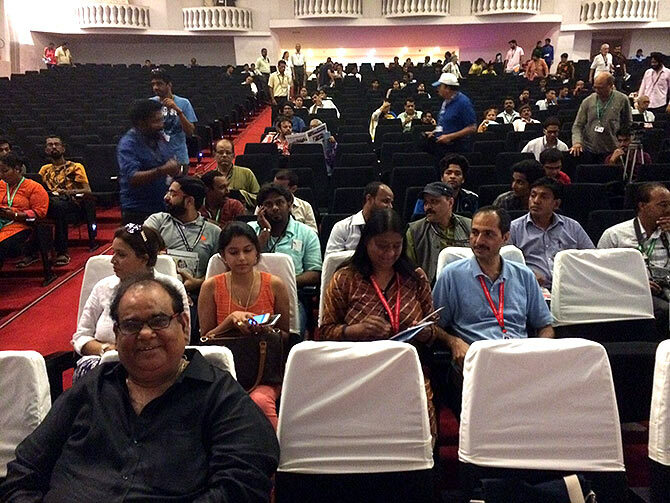 On Saturday, I was at the Kala Mandir theatre to moderate a conversation with actor-director Satish Kaushik. Director of 14 films, Kaushik has acted in over 100 movies. The subject of the master class conversation was Kaushik's life as an actor, starting from his modest upbringing in Delhi's Karol Bagh to training at the National School of Drama, acting on stage and then in films. Kaushik is a good talker and that made my task easier. His rags-to-riches story was quite inspiring for the audience, and they applauded through the session. Struggling with your weight loss? Can a college principal be on liquor company's board? Pakistan must know that we will respond!